Kevin Harvick (right) celebrates in Victory Lane after winning the Monster Energy NASCAR Cup series KC Masterpiece 400 at Kansas Speedway Saturday night. 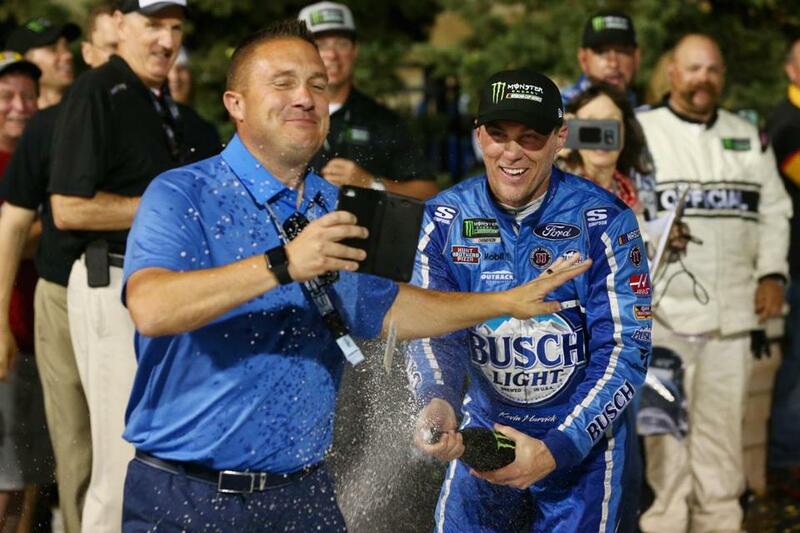 KANSAS CITY, Kan. — Kevin Harvick had just taken the checkered flag for the fifth time this season, wheeled his car into victory lane and bathed in another confetti shower when he lamented what could have been. ‘‘Still wasn’t really happy with it,’’ Harvick said of his No. 4 for Stewart-Haas Racing, which he set a record in Saturday night at Kansas Speedway by becoming the fastest to five victories. That shouldn’t make the rest of the Monster Energy Cup Series drivers feel very good about things. Harvick has won back-to-back races after a three-race win streak earlier this season, and heads into next week’s All-Star race at Charlotte as the one guy head and shoulders above everyone else. But his response to his victory at Kansas, where he overcame trouble getting through inspections and a car that was off much of the night, speaks to a couple of very crucial facts. First, it shows how demanding Harvick is of his team, and how nobody in the garage is willing to settle for greatness — not when there is perfection to chase. Pit stops could be cleaner, the car could handle the least little bit better, and the margin of victory could be even more comfortable. The second thing Harvick’s response to his victory demonstrates is that, well, he hasn’t changed a whole lot over the years. Harvick earned the nickname ‘‘Happy Harvick’’ as a joke, a play off the fact he was prone to emotional outbursts. And while he may have mellowed over the years, that streak is still in there, capable of rearing its head at the most unsuspecting of moments. Given the way the season has gone, though, Happy Harvick probably ought to be simply happy. He began his winning streak at Atlanta, continued it at Las Vegas and made it three straight with a triumph in Phoenix. An early wreck in California ended the streak, but he finished in the top 10 in each of the next five races, including a second-place run at Texas and a pole at Talladega. Harvick returned to his winning ways at Dover, when he started second and led 201 of the 400 laps en route to a dominant victory. And the hot streak continued at Kansas, where he had to race out of the garage for qualifying because of problems at inspection and still landed on the pole. He was clearly the fastest car on the track early on, then struggled to keep pace with Kyle Larson and Ryan Blaney through the middle stretches. But a series of late wrecks, including a tangle between Larson and Blaney that knocked the latter from the race, reset the field for a final sprint. With four fresh tires, Harvick roared from sixth on the restart with 10 laps to go, chased down Truex at the start-finish line of the final lap and cruised to his record-setting win. One that left everybody else feeling just a bit helpless. Indeed, the entire Stewart-Haas stable has had a ton of speed this season. Clint Bowyer ended his long victory drought at Martinsville, and teammate Aric Almirola was in the top 10 on Saturday night. Harvick said the same thing: When you’re on a hot streak, you have to ride it as long as possible. Maybe that’s why he bemoaned what little bit of speed was left on the track Saturday night, and why he is pushing his team so hard despite so much success. He knows that everything can spin the other way in a hurry, and that it’s time for him to make the most of his chance out front.